Watch your dining room take on a new shape with the Amish Hampton Dining Room Chairs making a splash! With a chair back that takes on a strong and shapely pattern, the Hampton cultivates a contemporary display. A wide top rail offers plenty of room to lean your head back for a rest as you dine, celebrate and socialize with loved ones. Contemporary style furniture features strong shapes and smooth profiles that stand out from the rest. 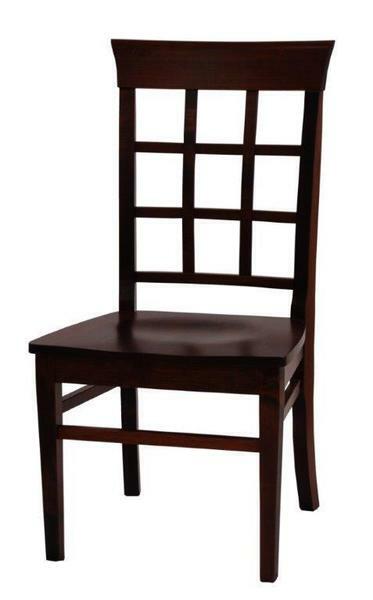 The squares of the Amish chairs bring this fun form to the forefront in your modern dining room. Browse our contemporary furniture collection for more modern styles for other rooms. Choose red oak or brown maple wood for the Hampton Dining Room Chairs. Add a fabric or leather seat if you wish. Our custom made dining chairs are handcrafted by skilled Amish woodworkers who devote their lives to their craft. Only the best premium solid hardwoods are used in the construction of your Amish furniture, resulting in dining chairs that will last to serve your home for decades. Call us today with any questions about our solid wood furniture, or visit the DutchCrafters Furniture Store in Sarasota, Florida to experience Amish designs in person. Call anytime toll-free 866-272-6773. We are happy to answer your questions.